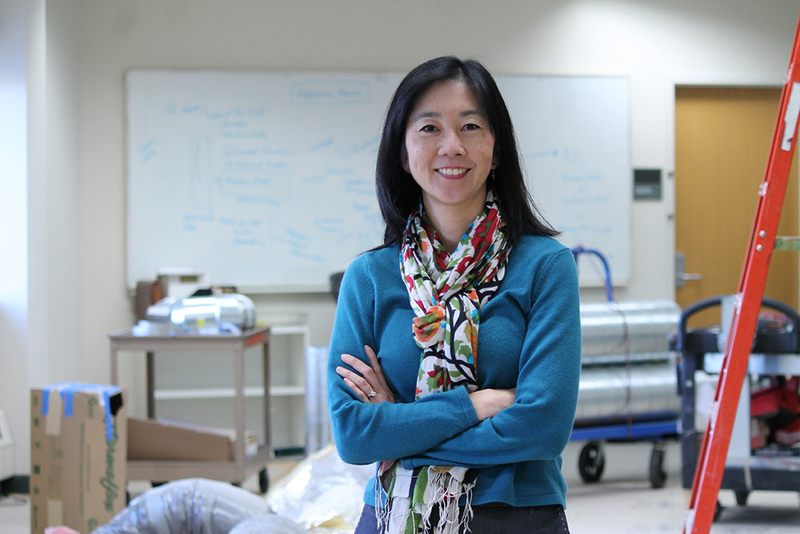 Associate Professor and Sonderegger Research Center (SRC) Director Michelle Chui is leading a remodel of the SRC to facilitate easier collaboration. Behind an unassuming door on the second floor of the University of Wisconsin–Madison School of Pharmacy, you won’t find microscopes or orbital shakers, no compounding supplies or test tubes. What you’ll find instead is a host of researchers tackling pressing issues surrounding medication outcomes, as members of the Sonderegger Research Center (SRC). Established in 1985, under the leadership of Professor Betty Chewning in the School’s Social and Administrative Sciences (SAS) Division, the SRC was the first center in the nation focused on health services research in pharmacy. Throughout its first 32 years, the SRC pulled in an impressive $10 million research funding. The SRC’s new director, Associate Professor Michelle Chui, appointed in October 2017, has a sharpened vision for the Center to further accelerate research, enhance collaboration, and improve medication outcomes throughout the state of Wisconsin. That range of issues includes medication adherence, opioid stewardship, pharmacist interventions, health disparities, expanding pharmacy operations, and technology development, implementation, and adoption. As a part of the relaunch, Chui dramatically increased SRC staff, created an executive committee of health professionals to guide the vision, and is taking a multifaceted approach to cultivating collaborative relationships both within the School and across the state. To direct the focus of the relaunched SRC to where it’s needed most, Chui formed an executive committee with broad representation that will guide the research agenda and provide perspective from academic and practice settings. The group includes Chui and Professor Dave Mott, chair of the SAS Division; Professor Barry Gidal, chair of the School’s Pharmacy Practice Division; Paul Smith, a newly retired professor in the UW–Madison Department of Family Medicine; Duane Kirking, who serves on the School’s Board of Visitors; Mohammad Kharbat, regional director of pharmacy services for SSM Health of Wisconsin; and Patrick Cory (BS ’92, PharmD ’95), the program director for pharmacy benefit management services at Quartz. Vic Bangston (right) joined the Sonderegger Research Center as an associate research specialist, and Martha Maurer and Aaron Gilson joined as scientists as part of the center’s expansion. Having clinical expertise on the committee is a key part of Chui’s long-term goals. “I want to expand the SRC so that it has the infrastructure to support a breadth of research going on under this roof, including practice-based research,” Chui says. After hours of initial provocative and insightful conversations about the potential and limitations of current medication research, the committee settled on a clarified mission for the SRC: to advance multidisciplinary research and evidence-based policymaking, promoting safe, high-quality and cost-effective medication outcomes. And with the freshly defined purpose, came a slightly augmented name: the Sonderegger Research Center for Improved Medication Outcomes. To make that vision a reality, Chui has more than has quadrupled the SRC’s research staff within the last year, from three members to thirteen, including three additional scientists, Aaron Gilson, Martha Maurer, and Laurel Legenza (PharmD ’10), Associate Research Specialists Vic Bangston and Brendan Flynn, Researcher Jamie Stone, Research Specialist Ka Xiong, and postdoctoral fellow Nam Hyo Kim (PhD ‘18). Kate Rotzenberg (PharmD ‘07) also works in the SRC, as an administrator for a state-wide practice-based research network. The SRC staff includes a number of primary investigators (PIs), who can lead their own research and apply for their own grants, as well as staff who support the PIs and the faculty researchers within the School of Pharmacy. Chui plans to further build the Sonderegger Research Center’s capacity by bringing in more researchers who are strong in the area of pharmacy and health care research within the broader health care system, expanding beyond the faculty in the Social and Administrative Sciences Division to include faculty from the School’s Pharmacy Practice Division, as well as outside collaborators from the Schools of Nursing, Engineering, Medicine, and the social sciences—anyone interested in improving medication use and outcomes. “I want to not only recruit members, but I want to provide an infrastructure to help them be successful,” Chui says. 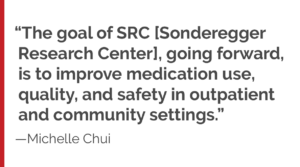 Because the group has rapidly expanded, Chui is remodeling the SRC’s 2,385 square feet within the School of Pharmacy to ensure that the staff has space to work that makes sense. In designing the renovated space, she created areas for quiet and independent work and added two glass-paneled conference rooms with one goal in mind: collaboration. The SRC’s two new conference rooms are designed to provide a space for faculty and staff to gather and discuss projects and possibilities, but they’re also equipped with large monitors and webcams in the event that on-site meetings are inconvenient or impossible. “I want people to be able to work together in spaces that makes sense for them, and I also want them to be able to work remotely with community partners,” Chui says. The SRC holds monthly guest presentations to encourage research collaborations. To further facilitate collaboration, the SRC has begun holding mock study sessions, wherein researchers can get help evaluating grant applications prior to submission to address all possible weaknesses, as well as monthly lunches that host guest speakers to talk about their research and engage in productive conversation. 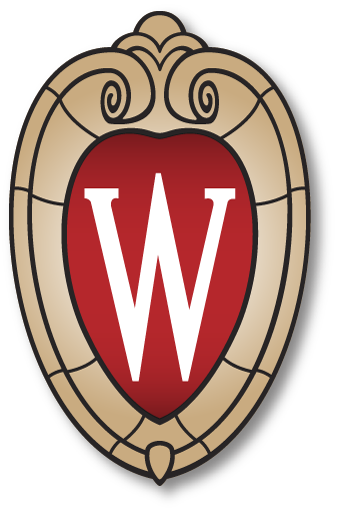 The SRC has been an affiliate of UW Institute for Clinical and Translational Research (ICTR) since 2007 to support interdisciplinary research and translate those findings into practice, in service of the Wisconsin Idea. SRC provides research support to ICTR faculty and investigators on campus—by providing resources such as space, equipment use, manuscript formatting, and data protection—and the SRC’s interdisciplinary faculty members have long collaborated with Wisconsin pharmacists to improve people’s health in the state. A far-reaching collaborative opportunity led by the SRC is the Pharmacy Practice Enhancement and Action Research Link (PEARL Rx), an ICTR-funded practice-based research network of more than 200 Wisconsin pharmacists that provides infrastructure for application-oriented research. Researchers have access to a network of practitioners to provide a broader set of research data, whether that means completing or sending out a survey about friction points in daily practice, or testing an intervention and measuring results. Associate Professor Michelle Chui, Pharmacy Society of Wisconsin Senior Vice President of Professional Services Sarah Sorum (PharmD ’05), PEARL Rx administrator Kate Rotzenberg (PharmD ’07), and School of Pharmacy Dean Steve Swanson at the PEARL Rx booth during the PSW annual meeting. “We’re rethinking our vision, mission, strategic plan, and partnerships with outside organizations to strengthen PEARL Rx,” says Chui. The SRC is building a new partnership with the Pharmacy Society of Wisconsin (PSW) related to PEARL Rx, in which both groups work together to help practicing Wisconsin pharmacists collaborate with UW–Madison researchers. “Our collective goal is to conduct projects that are directly applicable to pharmacy practice and improve patient outcomes as a result,” says Sarah Sorum (PharmD ’05), senior vice president of professional services at PSW. “PEARL Rx represents a collaboration among all of our Wisconsin schools of pharmacy, which is a unique feature among research networks and one of our network’s major strengths,” she says. PSW, which has a huge network of pharmacists around the state, can notify relevant pharmacists about PEARL Rx opportunities and research, while the School of Pharmacy provides infrastructure to advance PSW’s studies. “PSW is trying to expand their research portfolio and needs researchers to support their initiatives, so that’s where we come in,” says Chui. “It’s a match made in heaven. Now, we can build this more structured, permanent partnership that creates a healthier Wisconsin,” says Chui. Since October 2017, the Sonderegger Research Center has brought in $3.7 million in research funding, with another $1 million still pending. The expertise and current projects fueling the strong increase in the pace of funding are broad and far-reaching, touching on everything from cystic fibrosis medication adherence, to the opioid crisis, to new communication tools. Senior Scientist Aaron Gilson, for example, recently released maps and a data set with the Law Atlas Policy Surveillance Program that allows pharmacists and researchers to compare state laws and other regulatory policies related to pain care, such as whether states define a maximum amount for a prescription of a controlled substance, and what that maximum amount is. This data, Gilson hopes, can provide a foundation for future research into how policies impact medication use and misuse. Jay Ford, who is an SRC member and an assistant professor in the Social and Administrative Sciences Division, has two five-year R01 grants from the National Institutes of Health National Institute of Drug Abuse. One is testing the effectiveness of motivational interviewing for substance use within community-based HIV/AIDS service organization. Another is exploring the effectiveness of NIATx strategies, which is a model of process improvement for behavioral health care settings developed in the UW–Madison Center for Health Enhancement Systems Studies, in implementing integrated services for patients with co-occurring substance use and mental health disorders. Chui herself is researching the implementation of CancelRx, a new e-prescribing tool that notifies pharmacists when a medication is discontinued by a prescriber, through funding by the Agency for Healthcare Research and Quality and Gordon and Betty Moore Foundation. In another project, Chui is also researching how a system redesign of the pharmacy aisles paired with signage changes can improve OTC medication safety among older adults, through a $1.5 million grant also from the Agency for Healthcare Research and Quality. “The research happening within the Sonderegger Research Center has the ability to impact and improve thousands of Wisconsinites’ lives,” says Chui. Learn more about getting involved in pharmacy practice-based research with PEARL Rx.